They came in triumph, after a bold and unlikely victory. The only thing they were not bold enough to do was claim it. David Cameron and Nicolas Sarkozy could not have asked for more from Libya on Thursday as they toured Tripoli and Benghazi, the cities they decided at great political risk to liberate from the grip of Col Gaddafi six months ago. In Tripoli’s main hospital, doctors climbed over each other to touch them. In Benghazi, babies are being named after the French president. “My wife was about to give birth on March 19 and Gaddafi was coming to kill us all,” Mustafa, father of Sarkozy Bosen, told them. As David Cameron took to a podium to address the crowds massed in Liberation Square, which not long ago cowered under Col Gaddafi’s bombardment, they chanted their greeting in unison: “Thank You Cam-Ron; Thank You Cam-Ron”. But both are aware of law and precedent. The law – the United Nations Security Council resolutions they promoted – says they are not the liberators of Libya, and that the bombers which destroyed tanks and militias and cleared paths for the rebel armies were just protecting civilians. The precedents are the memories of President George W. Bush claiming “Mission Accomplished” in Iraq in 2003, and Prime Minister Tony Blair’s “Kosovo Moment”, his popular acclaim at the end of the Balkans War. That moment paved the way for the sense of invincibility and mission which so tarnished the second half of his decade in office. And so the leaders who drove Europe and NATO into one of the least predicted wars in modern history could only dole out the tributes, even as the domestic television cameras for which their visit was largely arranged focused on the tributes they received. “It is great to be here in free Benghazi, and free Libya,” Mr Cameron said. President Sarkozy was similarly grandiloquent, yet self-effacing about the near certainty that without the French air raids which destroyed the army advancing on the city in March it would have fallen and the revolution collapsed. “You wanted peace, you wanted liberty, you want economic progress. France, Great Britain and Europe will be on the side of the Libyan people,” he said. The French and British leaders arrived in Libya on Thursday by separate jets at Tripoli’s Matiga Airport, a former US military airbase, and travelled in convoy to the city’s main hospital to meet victims of the war and those caring for them. Mr Cameron later promised to provide 50 beds at specialist British hospitals to fit prosthetic limbs and provide rehabilitation – though Libya would be paying, he added, aware that the costs of the military operation have not been universally popular at home at a time of cuts. At a subsequent press conference with the provisional president and prime minister of Libya, Mustafa Abdul Jalil and Mahmoud Jibril, he outlined other assistance: money for de-mining and for policing and help with hunting down the vast stockpiles of weaponry that have gone missing in the war, including surface-to-air missiles. His spokesman meanwhile said a new resolution was being drafted at the United Nations to lift the arms embargo on Libya, establish a UN mission in Tripoli, allow for a gradual unfreezing of remaining assets overseas, and lift the no-fly zone. She also confirmed that the Foreign Office was relaxing travel advice which warned against any travel to Libya, saying that “essential” visits could be undertaken to the main liberated areas, including Tripoli and Benghazi. 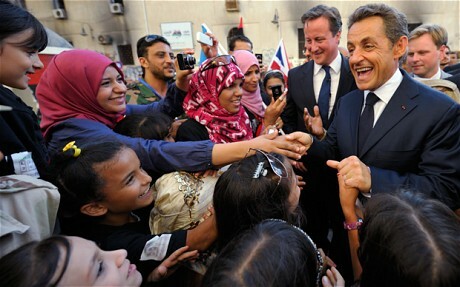 Mr Cameron was noticeably downbeat in Tripoli, happy to play second fiddle to Mr Sarkozy’s greater prominence. Libyans assign first place in their list of saviours to France, something reflected in the thanks offered by Mr Abdul Jalil. “France was in the forefront to strike Gaddafi forces and prevent a massacre in Benghazi,” he said. He said that Britain had played an “increasingly important role”. As Mr Cameron kept himself to an admission that he was “proud of the role Britain played in helping”, Mr Sarkozy took in the sweep of history. Libya’s own leaders are fully aware of the ambiguity of the French and British positions – particularly as countries which once curried favour with the Gaddafi regime. But even as Mr Sarkozy insisted that he had done it for “justice” and not for business contracts, they made clear that the rewards for Britain and France would be practical. Mr Abdul Jalil said that existing contracts would be honoured – after vetting for prior corrupt practices, a warning that will send a shudder through some western boardrooms – but that when it came to new ones favours would be returned. “Our friends will have the premier role, will have a front-line role, according to their efforts in supporting Libya,” he said. It was a message Mr Cameron and Mr Sarkozy no doubt wanted to hear, but perhaps not quite so publicly. Libya may be rich in oil, and economic times hard, but at a time like this they wanted to bask in praise, not ask for bail-outs.